I woke up this morning to the unexpected flakes of snow falling as I opened the window. It's April, early spring. Snow in April is not surprising, unexpected due to the last month of sunshine but not surprising. 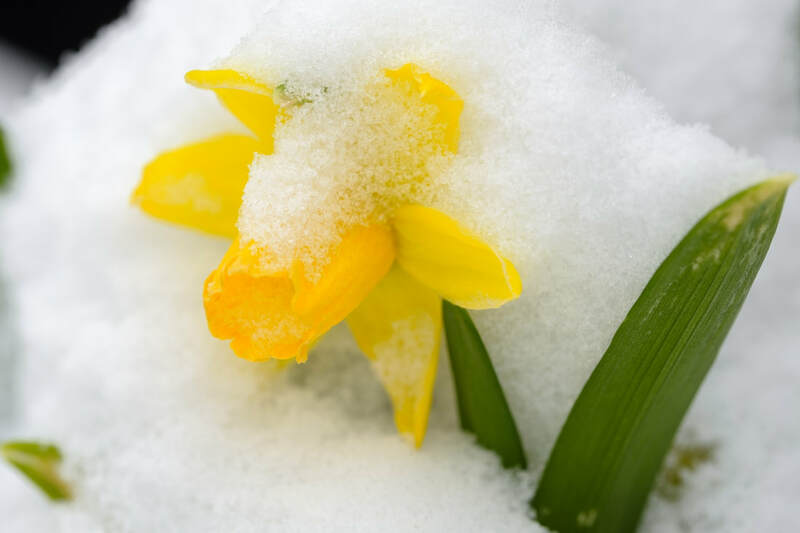 Humans have known that snow is possible even in spring. Our classical Chinese Medical text, Yellow Emperor Classic of Internal Medicine (Huang Di Nei Jing), written 3000 years ago, speaks of it. Spring is a time of changes, of warmth and cold, of winds. Hence, we must be careful not to open too soon. Not t-shirt weather just yet, keep the jacket on. Paying heed to this. Our garden project has already begun since the middle of last month. We have out vessels for planting ready on the balcony, earth awaits to be filled into these vessels. Seeds have been planted but inside, in a little "greenhouse," to keep the warmth and moisture ever present. The seedlings are thriving. We have basil, hyssop, coriander, gou qi zi, echinacea, to name a few. We wait till the middle of April to set the seedlings into their vessels outside, observing the weather to ensure that they have the best temperature and environment for growth. A garden, as we humans, needs to be nurtured. Sometimes, that means waiting for the right moment to move forward. Since a few weeks it's officially Spring! Beautiful rays of sunlight, spring rains, blossoming trees and plants, sneezing, runny nose, itchy eyes...If you experience Seasonal Allergic Rhinitis or Hay Fever, then you know what I am talking about. It can be frustrating to see the beautiful spring unfold and know that all this blossoming is going to make you sneeze. From the Western medical point of view, it is an inflammation of inner nose to an allergen. In Chinese Medicine, it is often viewed as a deficiency in the Lung and Kidney's Defensive Qi/Wei Qi, which then leads to the body's overreaction. In acute situations, this may produce a cold or heat condition with some invasion of what we call wind in the nose, leading to sneezing, or in the eyes, which leads to itching, reddening and irritation. If severe, it may move deeper into the body affecting breathing, causing asthma. So, what is Wei Qi? In Chinese Medicine, there is the idea of Qi, sometimes translated as vital energy, that exists in all living things and there are different kinds of Qi in the human body. One of them is Wei Qi. Translated as Defensive or Protective Qi, as it circulates and protects the exterior of the body, such as on/in the skin, the muscles and sinews. It deals with the outer world and helps us adapt to external changes. So Wei Qi is responsible for protecting our bodies from colds, flus, pollen, climatic changes and even psycho-emotional stressors. Returning to the theme of Seasonal Allergic Rhinitis, it is then very important to tone and strengthen the Wei Qi. Often, the strategy is Wei Qi Strengthening in pre-allergy season, such as in autumn or in winter or early spring depending on when the acute symptoms begin. We do this with acupuncture, herbs and even self-massage techniques. Also, what you eat and getting enough sleep affects the Wei Qi. I personally am affected by Seasonal Allergic Rhinitis, which I have begun to call "Seasonal Irritation," and I have developed a personal strategy to cope with the issue over the years. I believe that words have power. If we attach ourselves to a particular "dis-ease," we will manifest the disease like a textbook. I have found that it's much easier to manage the symptoms and this phase of the year, which for me is about a month, since I began calling it Seasonal Irritation. I take my Chinese herbs pre-season and during the acute phase, do my acupuncture and limit exposure to the pollen. I do my Qi Gong exercises to stimulate the Wei Qi and my Yoga breathing techniques, which all help me cope. I have learned to adapt to the season, just as winter makes me put on a warm coat, spring urges me to take care of my Wei Qi. We live in a time of extreme change, which maybe was always so since the beginning of time. What we do in the here and now, determines the future. I end this post with a quote from the book 'Ravens of Avalon' by Marion Zimmer Bradley and Diana L. Paxson, "What you cannot do is to keep things as they have been. All things transforming into another until the world itself is changed. Bend or break - it's up to you."